John Cena made his in-ring return to the WWE on October 6th at Super Show-Down in Melbourne, Australia -- wherein Cena competed in a Tag Team Match. Cena grabbed several headlines due to the man's usage of his "Sixth Move of Doom" for the very first time in a high-profile match in WWE. However, the WWE icon's new look served to grab an even more considerable amount of the WWE Universe's attention. John Cena has, for long, been regarded as one of the most consistent performers in the professional wrestling industry, and was considered as the face of the WWE until Roman Reigns took over that slot from him a few years ago. Cena's look has been somewhat constant over the years, and as opposed to most other WWE Superstars who love experimenting with their appearance, Cena and the WWE chose to have him maintain a specific clean-cut, short-haired look over the years. It was back in the 2000s that Cena was involved in a feud with JBL (John Bradshaw Layfield) over the WWE Championship -- a rivalry which saw the former emerge victorious and continue his ascent to the top of the sports-entertainment world. Well, given how John Cena's aforesaid feud with JBL was one of the most memorable ones of both Superstars' respective careers, the large majority of fans were shocked when Cena -- sporting his new look where he seems to have grown out his hair a bit -- seemed to bear a striking resemblance to JBL. Fans as well as critics of The Champ subsequently began insinuating that Cena, now 41, seems to be looking more and more like his former rival JBL. As noted, John Cena stars in Project X alongside legendary martial artist and widely beloved action movie star Jackie Chan. Cena is expected to continue performing for the WWE on a part-time basis. Meanwhile, JBL occasionally appears as an analyst for the WWE. 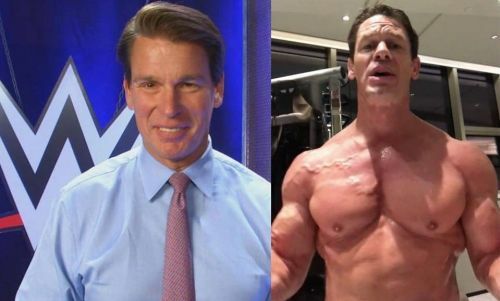 What do you make of John Cena's comments regarding the comparisons to JBL? Do provide us your feedback in the comments section below.